As there is no set fee structure for Civil Celebrants, you'll find that prices & services vary greatly within the industry. My fees are not the lowest & nor are they the highest, however I'm confident you'll agree that I provide value for money service. Ultimately you'll have the same legal aspects of marriage covered (which is a mandatory requirement for all celebrants) regardless of whether you choose a ceremony which costs $500 or $800+. The difference you'll find will be in the type of services provided. Some are no-fuss style, just the legal basics ceremonies, while others are a very personalised & grand affair! 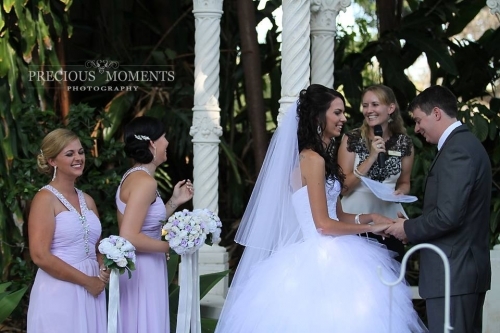 There is a celebrant to suit every couple & their particular needs & desires. That's why it's important that when choosing 'your celebrant', both you & your fiance are completely happy with their style, personality & services offered. I am passionate about providing the best & most personalised service possible, & I ensure that each couple feels completely supported throughout the whole process of getting married. Your wedding ceremony can be anything you would like it to be... whether you'd like a simple, no-fuss ceremony, or a grand affair which includes your personal story and a ritual or two, that's fine, and I'm happy to create it for you. We will brainstorm for ideas so we can create your dream ceremony. For couples wanting a very personal ceremony, I encourage you to complete my “Couple’s Activity” which is a questionnaire asking for such information as how and when you first met, what you love most about each other and more. I then create your ceremony, including ‘your love story’, and where possible I weave some of the other information you have given me, throughout your ceremony, to completely personalise your one of a kind wedding. If you’re stuck for words, or are not confident writing your own personal vows, I am happy to write them for you using your own words from the Couple’s Activity where possible. Alternatively, I have many sample vows for you to choose from or mix and match. You may find that reading these may just inspire you to then alter what I have written and re-write the vows yourself, or you may absolutely love what I put together for you and choose to keep them as is. Either is fine. Couples often like to include mini ceremonies or rituals such as the “Love Lock Tree of Life Ceremony”, “Wine Ceremony” or “Rose Ceremony” or the ever popular “Unity Sand Ceremony”. You are welcome to include one or more mini ceremonies and even a poem or reading if you wish. 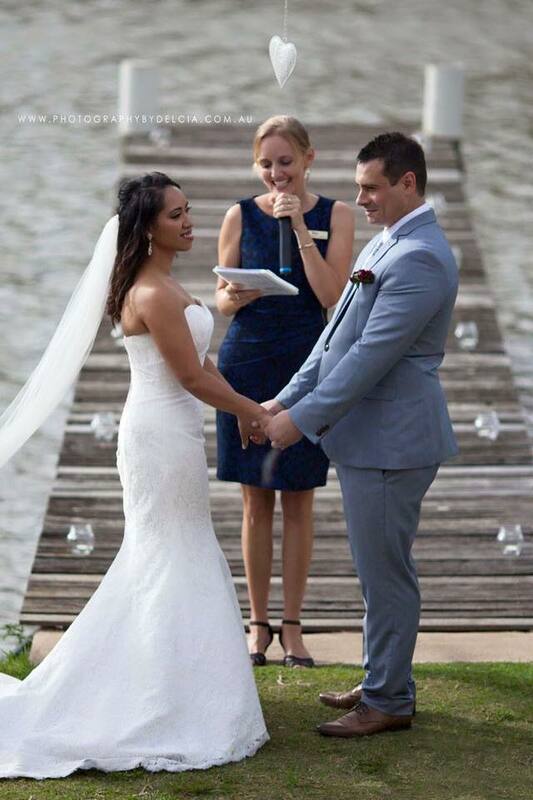 If you'd prefer however, we can keep your ceremony simple yet personal... the choice is yours. If there is a special person (or two), who is not part of the bridal party, yet you would like to give them an active role in the ceremony, let me know and we can brainstorm together to work something out. With your ideas and my creative writing skills, together we will create a ceremony that you and your guests will treasure and remember fondly forever! ~ Your wedding ceremony may be held at any location - such as in a park, garden, in your own back yard, in a hot air balloon… almost anywhere you like really! ~ Creating your wedding ceremony – once you have made the commitment to have me as your celebrant (by way of paying the non-refundable deposit of $100 & we have completed the NOIM form), I will then need your responses to the “Couple’s Activity” (if you've chosen to do this), and I can begin the process of creation! Once I have completed your ceremony I will email it to you for approval. If there is anything at all that you wish to amend, that’s absolutely fine (provided it’s not part of the legal wording or requirements). We can make as many changes as needed to ensure your final draft ceremony is exactly as you wish, and you are proud and excited about it. ~ Three to four face to face meetings – this includes our initial meeting; the second meeting where we complete the Notice of Intended Marriage form (if this was not done during the first meeting which is often the case); the rehearsal; and the wedding day. ~ Unlimited Contact – You are free to contact me as often as you like via email, phone call or text message, or facebook message. ~ Wedding Rehearsal – a rehearsal is usually held at the venue around 1 week prior to the wedding day, (or even the day before, if this suits best). We will briefly go over the order of the ceremony, the bridal party may practice walking down the aisle, and we also need to complete the ‘Declaration of No Legal Impediment to Marriage’ (another part of the legal process). ~ Conducting your wedding ceremony – On the day I will arrive approx. 30 – 40 mins prior to ceremony start time; and your ceremony will be conducted in a professional, and relaxed manner. ~ Ceremony duration - Generally anywhere between 20-40 mins (it’s up to you). ~ Notice of Intended Marriage form – I am happy to assist couples with completing this legal document, which I must receive and we sign together, no later than one calendar month prior to your chosen wedding date, and no more than 18 months prior. ~ PA System with inbuilt CD/MP3 Player – For the wedding ceremony, I provide the use of a portable battery operated professional PA System (which does not need a power supply at the venue) so that all guests are able to hear the ceremony wording. There is an inbuilt CD/MP3 player, and I request that if you wish for your chosen ceremony music to be played through my system, you please give it to me at the rehearsal on CD or USB (so I may test that it plays properly through my system prior to the wedding day). ~ Signing table – If required I will provide a signing table, two white chairs, table cloth & simple table decorations, as well as a pen to sign with. ~ Travel – A distance of 25km from my home in Karana Downs, Brisbane is covered by my fee. Any travel over and above this will incur an additional fee which is charged at 60c per kilometre (this is less than the amount advised by the ATO to be charged). I provide a copy of this form which you will need to complete. You must provide the original documents for me to sight as required by Queensland Births Deaths & Marriages. I will then post the application to BDM with the rest of your marriage paperwork, so your marriage can be registered. You should then receive your official marriage certificate from BDM within approximately 3 weeks after the wedding. The current fee to obtain the ‘official’ Marriage Certificate from BDM is $46.60 for the standard certificate or $61 for the commemorative package. This fee must be covered by you as this is separate to, and not included in my fee. I simply offer to post this application form & ID docs to help you by making the process smoother & easier for you. This is the Marriage Certificate needed if you wish to change your name. Please note… any additional travel expenses, such as travel over & above the stated 25km, toll fees, overnight accommodation or flights etc, incurred in relation to the performance of the ceremony will be charged accordingly. Interpreter/translation services are to be arranged by the couple and paid directly to the service provider. Any additional charges will be discussed & confirmed with you prior to payment of your non-refundable deposit of $100. * Prices & service inclusions are current as at January 2018 & may change without notice. Prices quoted prior to change will be honoured. I am continuously aiming to improve the service I provide for my couples & families, hence changes are regularly made to my packages offered, which sometimes results in price alterations also. Thank you for your understanding.